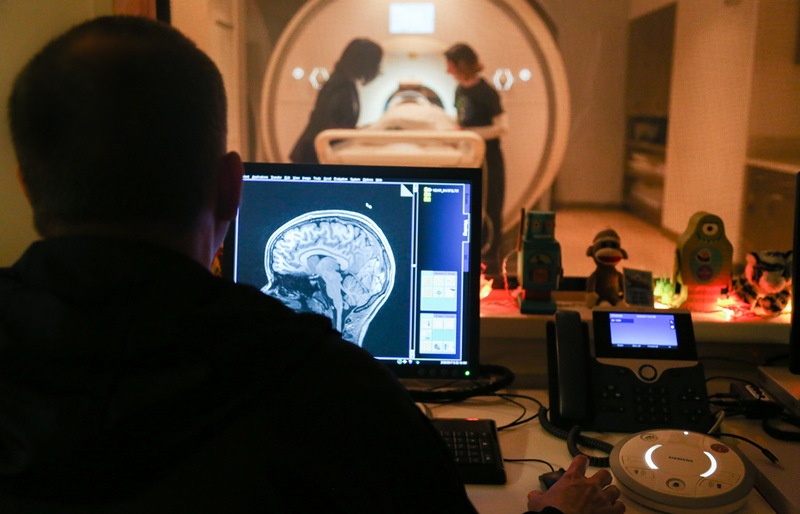 Research teams all across the globe are eagerly awaiting a major release of data from the largest study ever attempted on the adolescent brain. FIU is one of 21 sites studying nearly 11,874 participants collectively, including 2,100 twins or triplets. Researchers will follow the children, currently between the ages of 9 and 10, through young adulthood. Recruitment for participants wrapped up this fall. The ABCD Study is a national landmark study on brain development and child health that could increase understanding of environmental, social, genetic, and other biological factors that affect brain and cognitive development. Findings could reveal factors that can enhance or disrupt a young person’s life trajectory. Gonzalez is an associate professor of psychology, psychiatry and immunology, and a researcher at the FIU Center for Children and Families. He is leading the 14-member research team from FIU’s College of Arts, Sciences & Education and Robert Stempel College of Public Health & Social Work. The project includes child mental health and social work experts, as well as psychologists and a physicist, who have extensive track records in drug abuse research and cognitive neuroscience. Initial data from the first 4,500 children enrolled in the study was released in February with the next data set coming later this month. The interim data release will provide multiple important updates to the growing ABCD data while the study is in progress. This means that both ABCD investigators and non-ABCD researchers will have access to the datasets to pursue their own research interests. Data from the full cohort will be available in early 2019. MRI picture of preteen brain activity after children push the wrong button during a video game task (that is, after they make a mistake). 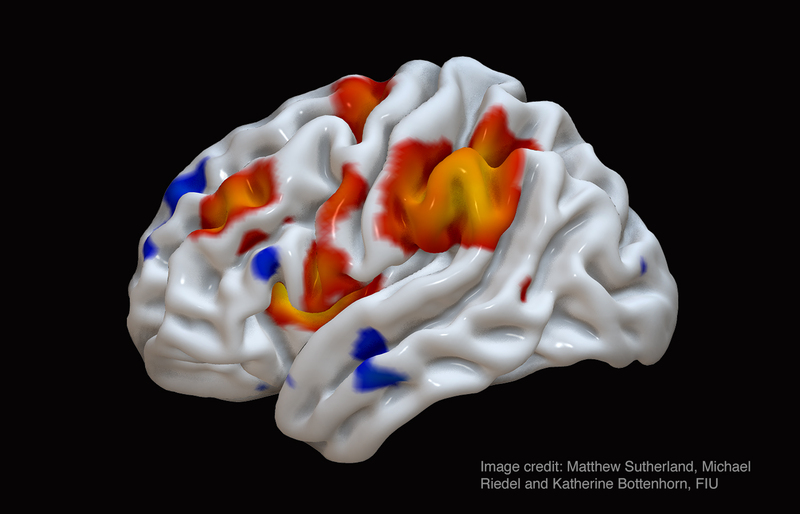 The “hot colors” (yellow, red) indicate brain regions showing more activity after a mistake (error). The “cold colors” indicate brain regions showing less activity after a mistake. Courtesy of Matthew Sutherland, Michael Riedel and Katherine Bottenhorn, FIU. With this data, scientists can look at brain characteristics associated with impulsivity and traumatic events. They can study the impact of health behaviors including sleep and physical activity on cognitive and brain development. They can also look at traits associated with media-use including screen time exposure. Researchers at FIU are investigating whether bilingual children have an advantage over monolingual children when it comes to problem-solving or control over behavior. They are also looking at how the number of siblings a child has may impact his or her developing brain. Researchers will also be able access a new tool through the NIMH Data Archive — the Data Exploration and Analysis Portal. The portal will allow users to analyze the data online without downloading it, while providing appropriate statistical models and tools that take advantage of the ABCD study design. The ABCD study is supported by the National Institute on Drug Abuse, the National Institute on Alcohol Abuse and Alcoholism, the National Cancer Institute, the Eunice Kennedy Shriver National Institute of Child Health and Human Development, the National Institute of Mental Health, the National Institute on Minority Health and Health Disparities, the National Heart, Lung and Blood Institute, the National Institute of Neurological Disorders and Stroke, the NIH Office of Behavioral and Social Sciences Research, the NIH Office of Research on Women’s Health, and the Division of Adolescent and School Health at the Centers for Disease Control and Prevention (CDC), with additional partnerships with the National Institute of Justice, the CDC Division of Violence Prevention, the National Science Foundation, and the National Endowment for the Arts. For more information, please visit the ABCD website at www.ABCDStudy.org.